While you may associate shredded coconut mainly with desserts, it can also be used in savory dishes, such as Indian curries. Depending on what you are making, you could use either sweetened or unsweetened shredded coconut, which is also sometimes called dessiccated coconut. Each type of coconut has a different nutritional profile. An ounce of sweetened shredded coconut contains 128 calories, 0.9 gram of protein, 14.5 grams of carbohydrates and 7.8 grams of fat, including 7.4 grams of saturated fat. Of the carbohydrate grams, 10.3 are sugar. 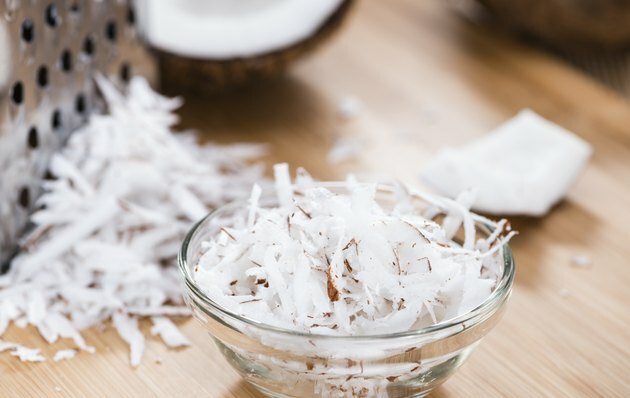 The same amount of unsweetened shredded coconut provides 185 calories, 1.9 grams of protein, 6.6 grams of carbohydrates and 18.1 grams of fat, including 16 grams of saturated fat. This serving only contains 2.1 grams of sugar. Both types of coconut are very high in saturated fat, with the unsweetened coconut providing 80 percent of the daily value and the sweetened coconut providing 37 percent of the DV per ounce. Consuming too much fat increases your risk for obesity, high cholesterol and heart disease. While shredded coconut isn't the healthiest food, it does provide a significant amount of fiber. You're better off with the unsweetened variety, which contains 4.6 grams, or 18 percent of the DV in each ounce, than with the sweetened type, which only has 2.8 grams, or 11 percent of the DV. Fiber helps add bulk to your diet and slows down the emptying of your stomach, helping you feel full for longer. It may also lower cholesterol and improve your blood sugar control. Although coconut isn't a major source of most micronutrients, an ounce of sweetened coconut contains 13 percent of the DV for manganese, and an ounce of unsweetened coconut provides 38 percent of the DV for manganese and 11 percent of the DV for copper. You need manganese for forming strong bones and processing cholesterol and copper for forming red blood cells and proper immune function. While it may seem odd that unsweetened coconut has more fat and calories than sweetened coconut, sweetened shredded coconut has a higher water content, consisting of 15.5 percent water compared to only 3 percent water in unsweetened coconut. This is why it isn't always a good idea to substitute one type of coconut for the other, according to "Fine Cooking." Unsweetened coconut often contains fewer preservatives than sweetened coconut and isn't usually treated with sulfites to keep it white like sweetened coconut. This results in a stronger but less sweet coconut flavor.